Monitor bilge pump activity, voltage, GPS, security, more in real time! Boat Command App available on Android, iPhone, iPad and Web! Why choose Boat Command Marine Telematics? We specialize in Marine Telematics. Our #1 priority is you, the user and the safety and connectivity of your marine vessel. We believe in our product and hold ourselves to the highest standards. We truly care about your boat as much as you do, which is why we offer the best support around at our dedicated support center. In addition, Boat Command constantly offers free updates with new features requested by our users. You can count on us. Every once in awhile a disruptive innovation comes along and completely changes a market – making a technology affordable and sensible for widespread use. Boat Command is one such innovation. Boat Command makes boat monitoring easy! Until now, the best option boat owners had for monitoring their vessels cost several hundred dollars, charged high monthly fees, and offered a cryptic text-messaging system for communication. 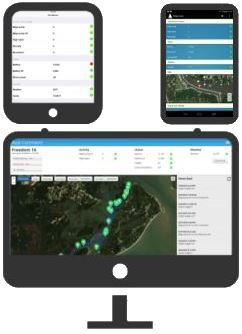 Boat Command’s new device makes it easy for boat owners to connect directly to their vessels using a free app on their smartphone or their computer’s web browser. From there they can monitor their vessels vital signs in real time, set up alerts for unusual activity, and even control desired functions, such as lighting, refrigeration, or air conditioning. All this for only $8.99/month for a remote Boat Monitor. Boat Command transmits your boat’s vital data via cellular towers to our cloud servers and then to your installed Boat Command app. “Boat Command has already saved me one disaster. I got a shore power alert a couple of days before the big cold front (arctic blast – whatever). Called the marina and they checked and found the shore power cable had pulled out of the socket on the dock. They plugged it back in, bilge heater worked, and the 15 degree nights were no problem. Thanks Boat Command, you will be on every boat I own.” – Greg M.
I have Boat Command on my boat and it’s great. My boat is a 1.5 hour drive. I find myself checking the Boat Command app regularly, just because it’s cool to know the battery voltage, temperature, motion sensor are all good. It’s great to know that when I get there with my family that the boat is ready to go. No more dead batteries upon arrival for me! Boat Command is great. I love turning on my AC a few hours before I get to the boat. Now my wife doesn’t complain about going to the lake on hot days. It’s fantastic. Boat Command is fantastic. I love being able to check on my boat while I’m away. It’s very nice to be able to turn on the ac system an hour before I get to the boat. I had a small issue and contacted Boat Command support and they helped fix my issue very fast! As a multi-location and multi-line boat dealer with marinas spanning 3 states and customers all over the world, literally, the Connect system by BoatCommand is a no brainer. We are in the process of installing a unit in EVERY boat we have in inventory. Being able to monitor a boats vital signs and even more importantly, the location, we are able to spend less time chasing inventory or simply jump starting a boat with a customer standing over our shoulder, because we can be warned when batteries are low and boats are moving….and that’s just the tip of the iceberg. Not to mention, our clients LOVE the fact they can monitor they boat from home or even when on vacation. The biggest perks we are seeing from them is bilge temp monitoring in the winter months (for those that don’t want to winterize) and GPS tracking and battery maintenance for the trailered boats. It’s awesome and should be on EVERY BOAT, period! I have the Boat Command from the boat show in Florida and use it a lot. I had concerns about the difficulty of installation but it was easy. One part I had an issue with was I could not figure out how to wire the shore power (I am not very knowledgable of wiring) and Rick from Boat Command helped me out and even shipped me extra equipment to help for free. Can’t really beat that customer service! Boat Command. Why pay more and get less?